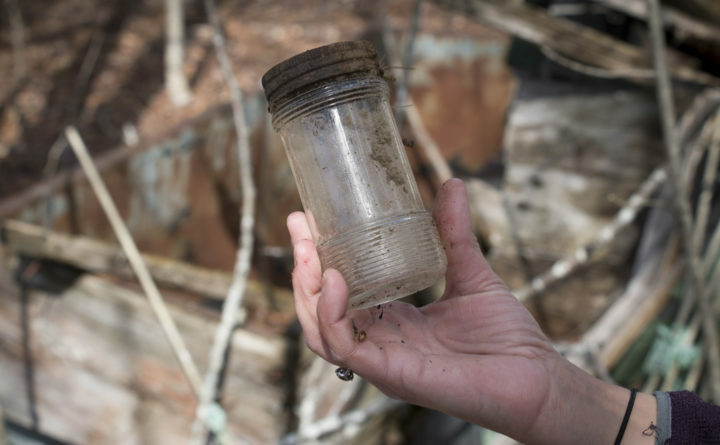 Ellie Barker uncovers what some people may consider to be trash in the woods near her home in Dedham. To Barker, it could by used as material for the furniture and decor she creates using found items. Homemade trivets at various stages are set out on the worktable of Ellie Barker of Dedham. She makes trivets by layering tile substrate, grout and polyurethane with discarded items such as broken plate pieces and rocks and glass bobbles from her old fish tank. 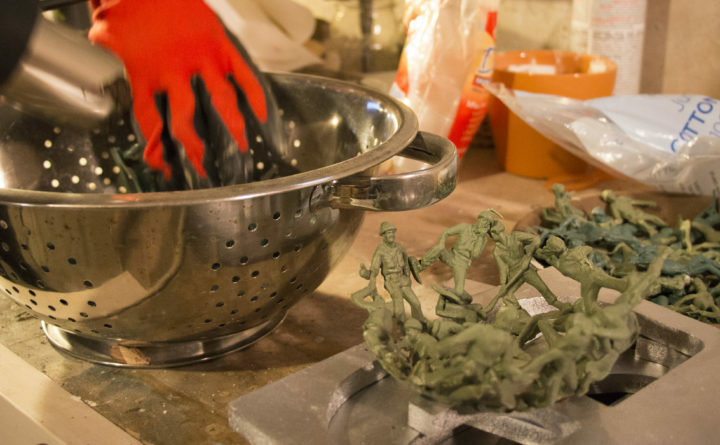 Ellie Barker of Dedham uses a heat gun to melt plastic army men into a bowl shape on April 5, in her basement workshop. Barker enjoys taking old, discarded items and crafting them into something new. Digging under leaf litter and piles of lingering snow, Ellie Barker unearthed a metal teakettle and an old glass jar, turning the dirt-coated items in her hands. 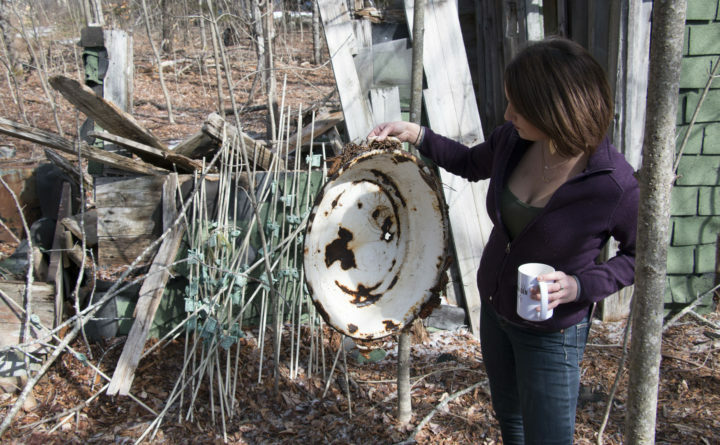 In the woods near Barker’s home in Dedham are heaps of discarded homewares dating back to the 1920s, and to most people, the forgotten pieces, rusted and often broken, would be considered trash. To Barker, they’re materials for her creations. Wine racks, trivets, soap dispensers and planters — Barker has made all sorts of decor items and furniture by upcycling old, tired objects and combining them in creative ways. All it takes it a bit of imagination and skill, fresh paint and hardware. The possibilities are endless. Barker has made clocks out of old cigar boxes, benches out of old skis and pallet boards, and a chair out of an old rusted shopping cart she found tossed in the woods near Kenduskeag Stream in Bangor. For the most part, she builds these things for herself or as gifts for family and friends, but sometimes she wiggles into a local gift shop and sells a few items. In fact, that’s how she initially got into the DIY world. While Barker only dabbles in selling her creations, some upcyclers in Maine have managed to make a successful business of it. Buxton resident Eric Rollins, for instance, creates furniture and decor from old doors, window frames and trim taken from demolished barns and houses throughout Maine. He also collects wood and discarded furniture from local dumps to refinish, retrofit and in some cases, combine to serve an entirely new purpose. “If I can relove it and make it new again and have somebody else get some enjoyment out of it for another 50 years, that’s great,” Rollins said. His small business, Rollin Rustics, is just a few years old, and it started with him refinishing a few tired pieces of furniture in the basement of his home. From there, he branched out until he was creating rustic bed headboards out of old doors, desks and tables from old farmhouse lumber and giant wall clocks out of scrap wood. “I rarely make the same things twice,” he said, adding that he creates a lot of custom pieces for local customers. Rollins now sells his creations online and in two gift stores: Buxton Antiques & Collectables and Main Street Mercantile in Bridgton. And this spring, he’s busy preparing to participate in the Vintage Bizarre New England, a show of about 80 vendors that offer vintage, upcycled and handmade items, running April 20-22 at Thompson’s Point in Portland. For people new to creating decor and furniture out of upcycled materials, Rollins had a few suggestions. Importantly, he said not to get overly ambitious for your first project. Rollins and Barker both draw inspiration from online sites that feature DIY projects such as Pinterest, then alter the ideas to fit their style or the materials they have readily available to work with. The heap of relics Barker discovered near her house has re-ignited her interest in the hobby. The discarded items come from an old, caved-in house, and she’s asked her neighbor permission to scavenge there. He doesn’t mind, she said. After all, he views it as trash. She also frequents second-hand shops like Salvation Army and Goodwill in search for interesting objects that spark her imagination. And rather than buy wood, she picks up scrap pieces from some friends who work in construction and she collects discarded pallets from local stores. This spring, Barker is crafting planters and bathroom organizers out of stained pallet boards and mason jars fastened with painted hose clamps. 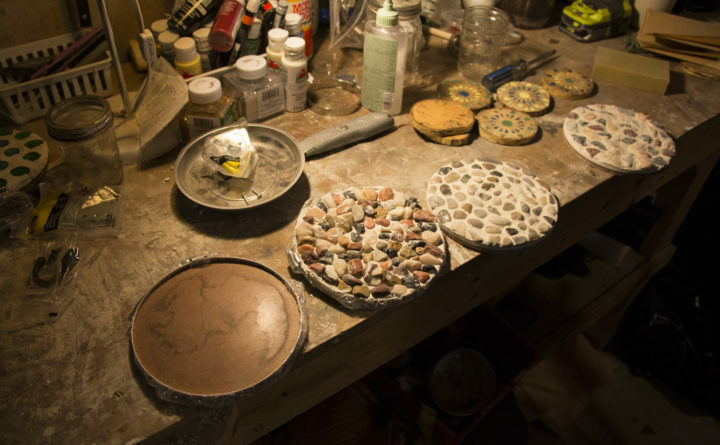 She’s also making mosaics trivets by layering broken flatware and pebbles from her old fish tank with tile substrate, grout and sealant — materials left over from recently finishing a bathroom in her home. While she pays for things like paint, polyurethane and hardware, she likes spending as little money as possible on her creations. That’s part of the fun of upcycling old items, she said, finding value where others don’t.